Las Vegas hosts the college Las Vegas Bowl. 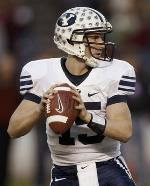 This year BYU, from the Mountain West Conference, returns to shine again. They go up against UCLA from the Pac-10. Last year BYU outshined the Oregon Ducks. This year they are favored because of recent events in the Bruin coaching staff. BYU lost to the Bruins early on in the season but are expected to win tomorrow. This is their 3rd consecutive appearance in the bowl and the crowd is a sellout. Go Cougs!